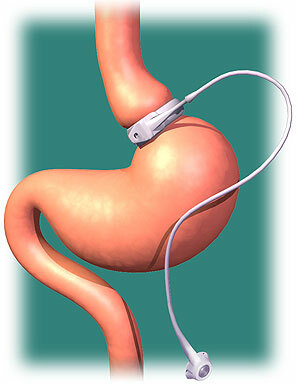 Gastric Band....Does it Actually Work..and is It Safe? Probably one of the worst ways of losing weight, is by putting a gastric band stomach. And one of the most unsafe. But, many obese people without drastic measures will die unless they find a way to drop weight. There can be a myriad of reasons why individuals are way overweight. Dealing with the underlying problem can take years, so quicker methods have been invented. Like the commonly called the stomach band or a lap band. Laparoscopic Adjustable Gastric Banding Surgery, the literal medical name for the procedure. While in surgery a surgeon place an adjustable silicone strap around the upper part of the stomach. The instrument can be loosened or tightened by use of a tube filled with a saline solution going from the stomach to just under the skin. People with 200+ lbs to lose can very easily drop 80 lbs in under a year. 50 lbs overweight does not make you a candidate for unsafe procedure. The invasive surgery should not be conducted on anyone but the morbidly obese. Those people who lives depend on losing weight swiftly. So, what are the complications that Dr. Rutledge is referring to? 8. dehydration: you're unable to get water past it into stomach. 19. AND YOU COULD DIE!!! There has to be a safer way to lose weight than using the gastric band!! !